← Anime&Manga: Huge Influence On Me. What About You? 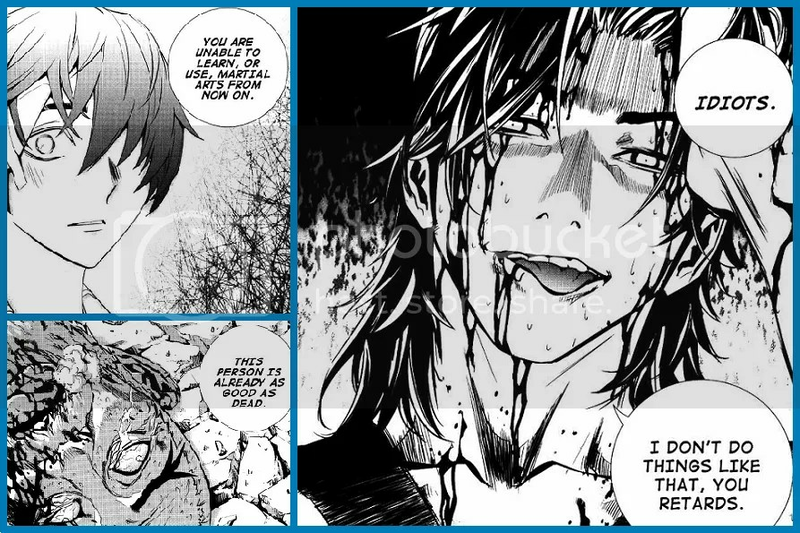 The Breaker: Chapter 70- Ruthless or Faking It? WOW, I cannot believe all that Chun Woon’s said and done. It caught me off guard. It’s frustrating not knowing if he really meant all that he’s said. He looked so evil as he said all those things with a smile/smirk. Aww, I feel so sad for Shioon. BUT it shouldn’t be assumed that Chun Woon meant everything that was said. Shioon will be in shock and won’t believe any of it. Still, it’ll affect him badly to even hear those words. I don’t think that will be the end of Shioon and martial arts. He’ll find a way to restore his Ki-generating core or find a way to allow him to practice martial arts once again. Do you see that foot right there? At the end? I think Chun Woon is trying to prove to them how much Shioon supposedly doesn’t mean much to him by crushing him with his foot? It’s possible. From what I’ve seen, Shioon is very important, he’s so important that Chun Woon would risk his life for this disciple of his. This is all a facade so that the Murim would leave Shioon alone since he now has no connection with the martial arts world any longer. Is Chun Woon faking it or is he really that ruthless? Is he so blinded by revenge that he would trade in his disciple for the chief? He’ll probably set out on a journey to find Chun Woon. But seriously, where is the guy now? This entry was posted in Completed, Manga, The Breaker and tagged action, JEON Geuk-jin, manga, manhwa, martial arts, PARK Jin-Hwan. Bookmark the permalink.